September 29, 1731 Letter from James Logan, representing WIlliam Penn, to London, Logan states "Patr. Boyd who was as good credit as any young man in the trade is actually gone off and run away with about 140 pounds in debt in my books." Will dated January 26, 1762. Probated February 18, 1762 in Halifax County, Virginia. A copy of the oral will from Will Book 0, page 140 : Halifax Court House, Virginia. Geo. Boyd the younger and Silvestor James being first sworn before William Stokes on of his Majestys Justices for the county of Halifax do declare that they heard Patrick on the day he departed this life in his own house express words to this purpose. My will and desire is that all my stock of cattle, hogs and sheep be sold and also my personal estate besides be also sold and the money arising by such sale after paying my just debts be equally divided between my wife Ann and her two children Richard and Henry and that 80 acres of land belonging to my lying on the north side of Dan River be rented out until the two children above mentioned come to the age of 21 years and then be sold and the money arising by such sale be equally divided between my two sons above mentioned. Certified under my hand the 26th day of January 1762.
i. GEORGE3 BOYD, b. Abt. 1740, Lancaster Co., PA Colony; d. 1802.
ii. JAMES BOYD, b. Abt. 1741, Lancaster Co., PA Colony. iii. WILLIAM BOYD, b. Abt. 1742, Lancaster Co., PA Colony; d. 1782.
iv. MARY BOYD, b. Abt. 1743, Lancaster Co., PA Colony; m. (1) THOMAS TINDALL; m. (2) MARY'S HUSBAND1 WADE. v. SARAH BOYD, b. Abt. 1744, Lancaster Co., PA Colony. vi. RACHEL BOYD, b. Abt. 1745, Lancaster Co., PA Colony. vii. JOHN BOYD, b. 1746, Lancaster Co., PA Colony; d. Unknown, Unknown Co., TN. viii. HENRY PATRICK BOYD, b. 1748, Lancaster Co., PA Colony; d. Bef. 1782.
ix. RICHARD COLEMAN BOYD, b. 1753, Halifax County, VA; d. September 28, 1823, Jasper Co., GA.
x. HENRY BOYD, b. 1755, Lancaster Co., PA Colony. Halifax was formed from parts of Lunenburg. 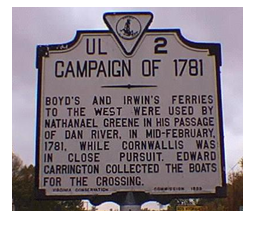 The Boyd and Irvine families ran ferries across Dan River. Patrick had a ferry of his own, and according to family lore, he made liquor (on Roger's Island) and floated it in kegs down the river to the ordinaries located at the ferry. Boyd's Ferry was one of the earliest river crossings established in Halifax County. The ferry crossed about where the Norfolk-Southern Railway bridge crosses the river today. The ferry's importance lay in part in the fact that over it passed the road from the south to Charlotte and Prince Edward Counties, Petersburg and Richmond. 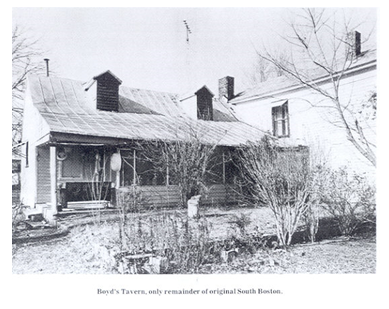 Boyd’s Ferry was the original town on the site of present day South Boston, VA. Patrick Boyd immigrated to PA from Ulster, Northern Ireland with his father George ca. 1713. They were of the group sometimes referred to as Scotch-Irish. Patrick and several of his brothers moved from PA to the Halifax area in 1731 while this area was still a part of Lunenburg County. These Boyds are not to be confused with Alexander Boyd who came from Scotland and established Boyd’s Tavern, in present day Boydton, VA.
1729, 5 Aug: Licensed as a fur trader, Lancaster Co., PA. Patrick Boyd was under contract to deliver pelts to James LOGAN, a fur dealer who represented William PENN in the Philadelphia area. 1731, 29 Sep: James LOGAN wrote a London fur merchant telling about difficulties he was having with fur traders. "Patr. BOYD who was a good credit as any young man in the trade is actually gone off and run away about 140 pounds in debt in my books." 1757 June Patrick Boyd Sr., was granted a license for him to keep a ferry from his landing on Dan River on the north side there of to his own landing on the South side of Dan River. 1763 Oct, Halifax Court: Thomas DOUGLASS is appointed Surveyor of the Road from Pole Bridge on Mirey Ck. and said Thomas and his male laboring tithables and those belonging to:....Patrick Boyd, George Boyd, et al..........do clear and keep the road in repair. 1773 May Court, Pg. 97, Halifax Co. Pleas Bk. 8: Justices were George Boyd, Thomas Yuille, Radford Maxey, and James Turner, Jun. 1773 May James Irvin comes into Court and with George Boyd, Gentleman, his security and entered into acknowledged bond with condition according to law for the said James keeping a Ferry over Dan River lately established by act of Assembley; and it is ordered that the said James attend constantly with two hands.